While boxing legend earned many Jewish fans, his legacy of anti-Semitism, racial separatism mirrored white supremacism. When three-time heavyweight boxing champion Muhammad Ali passed away last Friday, media outlets were swamped with eulogies for the 74-year-old former boxer, highlighting his cultural impact at the height of the Civil Rights movement in the 1960s. Indeed, Ali’s legacy goes far beyond the ring. His conversion to Islam in 1964 marked his metamorphosis from mere athlete to cultural icon, becoming a symbol of “Black Power” and radical black identity. Ali famously defied the draft in 1967 at the height of the Vietnam War, using the opportunity to decry “white imperialism." Mirroring militants like the Black Panthers, Ali embraced an ideology not of racial reconciliation and egalitarianism, but of racial separatism, one which was rife with disparaging views on non-blacks in general – and Jews in particular. Despite a long history of comments assailing Jews and decrying Zionism, Ali nevertheless won many Jewish admirers, and on the occasion of his death won praise from a slew prominent Jews. Former Israeli Attorney General Yehuda Weinstein will represent the State of Israel at Ali’s funeral, and the former boxing champ will be eulogized by Jewish actor and comedian Billy Crystal. 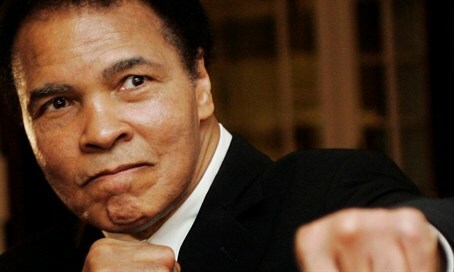 Ali’s hatred of Israel and support for anti-Jewish terrorism during his decades-long boxing career, many of his Jewish supporters claim, were tempered with age later in life, as they note his Jewish son-in-law and his participation in a Bar Mitzvah ceremony for his grandson. For much of his life, however, little differentiated Ali’s views both on race and the Jewish people from the rhetoric emanating from white supremacist circles. Like his white counterparts, Ali abhorred mixed race couples, saying that blacks engaged in romantic relationships with people of another race deserved to be put to death. Like other racial separatists, Ali lambasted Zionism as an omnipresent threat. He repeatedly called for the destruction of Israel and openly supported terrorists aiming to kill Jews. “In my name and the name of all Muslims in America, I declare support for the Palestinian struggle to liberate their homeland and oust the Zionist invaders,” Ali said during a trip to Lebanon. Ali famously sought the release of 700 terrorists held by Israel, referring to them as “brothers." Using Zionism as a code-word for Jews, Ali blamed Zionism for a plethora of cultural issues, frequently asserting that “the Zionists” control America – and by extension, the world. In his professional career, Ali blamed Jews for perceived setbacks, telling the New York Times in 1970 that it was “those Jewish promoters” who tried to prevent him from getting back in the ring with Joe Frazier. In 1984, Ali was diagnosed with Parkinson’s disease, an affliction which gradually reduced his involvement in public life. In his later years, Ali did abandon the kind of harsh rhetoric and stark racial separatism that characterized his boxing career. While the former heavyweight champion had refused in 1985 to negotiate for the release of Americans held captive in Lebanon during a trip to free Arab terrorists held by Israel, in 1990 he travelled to Iraq to press Saddam Hussein to release Western hostages. In 2002 he publicly pleaded with Daniel Pearl’s captors to set him free.